It is always such a delight to attend a show that you know will keep you singing, dancing and laughing well into the week ahead. 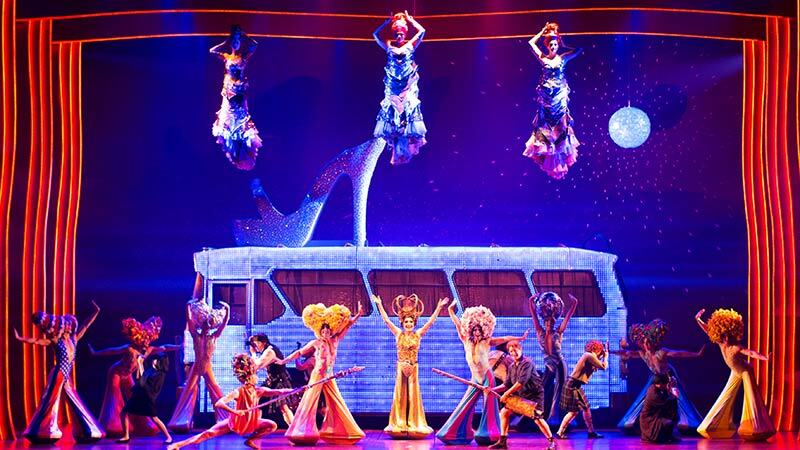 Priscilla Queen Of The Desert now at Sydney’s Capitol Theatre is one of those iconic stage shows which personifies everything that is so entertaining about great musical theatre. Adapted from the Stephan Elliott and Allan Scott book and 90s film, the dazzling eccentric costuming, infectious dance numbers, time-honoured disco hits and self-deprecating humour is packaged expertly into an over-the-top celebration of triumph over tribulation for our merry cast of drag queens from Sydney’s inner city. The central story is one of a gay man being anxiously reunited with his young son, but the universal narrative personified by main characters in this tale is one of having to find and live out our own individual truth … and what better way to discover that than on a road trip to central Australia! At times moving and soulful, the story is peppered with contagious song and dance numbers that keep the audience shaking their ‘Groove Thing’ well past the final curtain call. Lead actors Tony Sheldon, David Harris and Euan Doidge work seamlessly to deliver polished storytelling with animated performances. Tony’s portrayal of the jaded ageing drag queen Bernadette is precise and polished; while David delivers an authentic emotionally intense and angst-driven characterisation of Tick. A personal favourite is the effervescent and gorgeous Euan as Felicia. I have followed Euan’s young career now for a number of years and am constantly impressed by his level of professionalism, skill and sheer talent. The infamous ping-pong scene is still just as terrifying, but Lena Cruz’s feisty performance as Cynthia has us cheering for the character’s sense of liberated and vibrant autonomy … with one eye closed! Brian Thomson‘s production design is simple yet effective; combined with Tim Chappel and Lizzy Gardiner‘s unabashedly flamboyant costumes and Ben Moir‘s extravagant wigs. Original choreography by the iconic and very missed industry-revered Ross Coleman as well as Andrew Hallsworth is sensational and expertly delivered by the ensemble and lead cast. Unlike the original film, now two decades old, the reinvented stage musical is capable of endless evolution which this production handles brilliantly bringing a new edge and currency to the humour. With 24 time-honoured hits forming the soundtrack, songs like ‘I Will Survive’, ‘Finally’, ‘Hot Stuff’ and ‘It’s Raining Men’ keep audience members singing, humming, and planning to butcher them at karaoke at the next available opportunity as they dance out of the theatre … don’t miss this show while it’s in town … truly FABULOUS!